Thuggee (UK: /θʌˈɡiː/, US: /ˈθʌɡi/; Hindi: ठग्गी ṭhaggī; Urdu: ٹھگ‎; Nepali: ठगी ṭhagī; Sanskrit: स्थग sthaga; Marathi: ठक; Odia: ଠକ thaka; Sindhi: ٺوڳي، ٺڳ‎; Kannada: ಠಕ್ಕ thakka; Bengali: ঠগি ṭhogī; Punjabi: ਠੱਗੀ ṭhagee ) refers to the acts of Thugs, an organised gang of professional robbers and murderers. The English language word thug traces its roots to the Hindi ठग (ṭhag), which means 'swindler' or 'deceiver'. Related words are the verb thugna ('to deceive'), from the Sanskrit स्थग (sthaga 'cunning, sly, fraudulent') and स्थगति (sthagati, 'he conceals'). This term, describing the murder and robbery of travellers, is popular in the northern parts of Indian subcontinent and particularly India. Contemporary scholarship is increasingly skeptical of the "thuggee" concept, and has questioned the existence of such a phenomenon, which has led historians to describe "thuggee" as the invention of the British colonial regime. Thugs are said to have travelled in groups across the Indian sub-continent. There were numerous traditions about their origin. One recorded by D. F. McLeod traced it to seven Muslim tribes formed from those who fled Delhi after murdering a physician. Another traced it to seven great Muslim families who fled after murdering a favoured slave of Akbar. These original Muslim Thugs spread Thuggee amongst Rajputs, Hindus, Lodhis and Ahirs. According to other traditions by Thugs, they were Kanjars or descended from those who worked in the Mughal camps. Others have blamed the rise of Thugs on the disbanding of armies in employment of Indian rulers after the British conquest. Thugs are said to have operated as gangs of highway robbers, tricking and later strangling their victims. To take advantage of their victims, the thugs would join travellers and gain their confidence; this would allow them to surprise and strangle the travellers with a handkerchief or noose. They would then rob and bury their victims. This led to the thugs being called Phansigar (English: "using a noose"), a term more commonly used in southern India. During the 1830s, the thugs were targeted for eradication by the Governor-General of India, Lord William Bentinck, and his chief captain, William Henry Sleeman. The Thuggee units would resemble the physical appearance of travellers. Initially they wore Turbans and carried with themselves some kinds of baggage. Their attire as travellers would deceive peasants and royalty alike. The methods used by the Thugs were meant to reap maximum loot and avoid being caught. They didn't accost travelers unless their own numbers were greater than the victims. They inveigled travelers they met, which gave them a chance to assess what wealth their targets might have. Many of them avoided committing thugee near the areas they lived, making discovering their crimes a difficult task. They often pretended to be either Hindu or Muslim to fool their victims. They usually attacked in the evening. A common method used by them was to distract their targets while striking to strangle them from behind. In order to avoid suspicion, they avoided carrying more than a few swords. Sometimes they mutilated corpses of their victims to avoid detection. The corpses were then hidden or buried. A leader of a gang was called jemadar. Usage of military-style ranks such as jemadar and subedar among Thugs as well as reference to individual members as a "private", suggests that the organisation of their gangs had a military link. They used a jargon known as Ramasee to disguise their true intentions from their targets. Although strangulation is one of their most-recognised methods of murder, they also used blades and poison. The thugs comprised both men who had inherited thuggee as a family vocation, as well as those who were forced to turn to it out of necessity. The leadership of many of the groups tended to be hereditary with family members sometimes serving together in the same band. Such Thugs were known as aseel. Many Thugs insisted, however, that novices were not taught Thuggee by their family but by others who were often more experienced Thugs, sometimes also called a guru. While they usually kept their acts a secret, female thugs also existed and were called baronee in Ramasee, while an important male Thug was called baroo. They would often avoid killing children of victims and instead adopted them. They sometimes tended to murder women and children to eliminate witnesses or in case they had substantial loot. Some of the thugs avoided murdering victims they considered proscribed according to their beliefs and let other unscrupulous members commit the murder or were forced to let them by those who didn't believe in their customs like the Muslim thugs. Surdas, in his allegorical couplet, mentioned robbers called "thags" who lured a victim while also killing and looting his property. The Janamsakhis used the term thag to refer to a robber who used to lure pilgrims. Jean de Thévenot in his account referred to a band of robbers who used a "certain Slip with a running noose" to strangle their victims. John Fryer also mentions a similar method of strangling used by robbers from Surat whom he saw being given capital punishment by the Mughals in 1675. He mentioned that three of them were relatives, which Kim Wagner notices is similar to the Thugs who were thought to have engaged in this as a family profession. A decree issued by Aurangzeb in 1672 refers to a similar method and uses the term "Phansigar". Sketch by the same artist of a group of Thugs stabbing the eyes of murdered travellers before throwing the bodies into a well. The garrote is often depicted as a weapon of the Thuggee. Other evidences suggest that the Katar (dagger) was their personal status weapon, the Thuggee wore this weapon proudly across their chest. Early references to Thugs reported they committed their strangulation murders with nooses of rope or catgut, but later they adopted the use of a length of cloth that could be used as a sash or scarf, and thus more easily concealed. This cloth is sometimes described as a rumāl (head covering or kerchief), translated as "yellow scarf"; "yellow", in this case, may refer to a natural cream or khaki colour rather than bright yellow. The Thug preference for strangulation might have originated in a quirk of the law under the Mughal Empire, which ruled most of India from the 1500s. For a murderer to be sentenced to death, he or she must have shed the blood of their victim. Those who murdered but did not shed blood might face imprisonment, hard labor and paying a penalty—but they would not risk execution. A poison called datura, derived from a plant in the Nightshade family, was sometimes used by Thugs to induce drowsiness or stupefaction, making strangulation easier. The "River Thugs" preyed upon people including Hindu pilgrims travelling using the Ganga river and became mostly active during the winter like their compatriots from Murnae, Bundelkhand and Awadh. Their dialect of Ramasee differed from the one used by their compatriots on land and used boats taken on lease from their builders or from a jemadar called Khuruck Baboo. Sleeman states that they tapped three times to give the signal to murder which they always committed during the day. To avoid detection of a corpse, they broke its back and threw it in the river to be eaten by crocodiles and only looted money or jewels. The British found out about them in Southern India for the first time in 1807, while in North India they were discovered in 1809 with an effort to suppress them being carried out from 1809–1812. After a dispute developed between the zamindar Tejun and the Thug Ghasee Ram in 1812, the latter took refuge with his family under another landlord called Laljee. Tejun in turn revealed the thugs of Sindouse to Nathaniel Halhed. 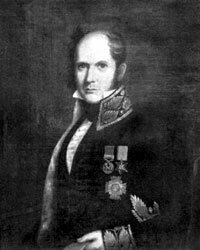 Thomas Perry, the magistrate of Etawah, assembled some soldiers of the East India Company under the command of Halheld in 1812 to suppress the Thugs. Laljee and his forces including over 100 Thugs were defeated, with the village of Murnae, a headquarter of the Thugs, destroyed and burnt by the Company soldiers. Laljee fled to Rampura and the southern banks of Sindh River but was caught by the Marathas who turned him over to the Company. British authorities had occasionally captured and prosecuted Thugs, circulating information about these cases in newsletters or the journal Asiatick Researches of The Asiatic Society. However, Sleeman seems to have been the first to realize that information obtained from one group of stranglers might be used to track and identify other thugs in a different district. His first major breakthrough was the capture of "Feringhea" (also known as Syeed Amir Ali, Khuda Buksh, Deahuct Undun and Daviga Persaud), who was persuaded to turn King's evidence. (Feringhea's story was the basis of the successful 1839 novel Confessions of a Thug). Feringhea brought Sleeman to a mass grave with a hundred bodies, told him the circumstances of the murders and named the Thugs who had committed them. After initial investigations confirmed what Feringhea had said, Sleeman began an extensive campaign using profiling and intelligence. The government of India established the Thuggee and Dacoity Department in 1835, with Sleeman its first superintendent. (Dacoity was a type of organized banditry, distinguished from Thugs most notably by its open practice and due to the fact that murder was not an intrinsic element of their modus operandi.) Sleeman developed elaborate intelligence techniques that pre-dated similar methods in Europe and the US by decades. All of the accused were given a prisoner number against which their name was added, while their residence, fellow Thugs and every criminal act they were blamed for was also noted down. The names of many of the Thugs was similar. They didn't have last names, instead the naming convention was based on names of their tribes, castes and the job assigned to them as part of a gang. The Thugs adopted many aliases, which was made more difficult due to both Muslim and Hindu thugs often posing as members of the other religion. Per the Thug Ghulam Hussain, though Hindus and Muslims avoided eating together, such was not the case for drinking and smoking. The campaign relied heavily on captured Thugs who became informants. These informants were offered protection on the condition that they told everything that they knew. According to historian Mike Dash, who carefully examined the relevant documents in the UK archives, suspects were subject to bench trials before English judges. Though the trials were lacking by later standards (e.g., suspects were not allowed legal representation), they were conducted with care to protocols of the time. While most suspects were convicted, Dash notes that the courts genuinely seemed interested in finding the truth and rejected a minority of allegations due to mistaken identity or insufficient evidence. Even by later standards, Dash argues, the evidence of guilt for many Thugs was often overwhelming. The "River Thugs" due to their methods were able to evade the British authorities years after their compatriots on land were suppressed until being betrayed by a compatriot from Awadh. The forces under the command of Sleeman hunted them down in 1836. By the 1870s the Thug cult was essentially extinct, but the history of Thuggee led to the Criminal Tribes Act (CTA) of 1871. Although the CTA was repealed at Indian independence, tribes considered criminal still exist in India. The Thuggee and Dacoity Department remained in existence until 1904, when it was replaced by the Central Criminal Intelligence Department (CID). He was on his way from Mhow to Bombay. We studiously avoided him. He proceeded next morning with a number of travellers who had sought his protection, and they took the road to Baroda. We do not know who he was; he flits across the page of this rusty old book and disappears in the obscurity beyond; but he is an impressive figure, moving through that valley of death serene and unafraid, clothed in the might of the English name. The day that sees this far-spread evil completely eradicated from India, and known only in name, will greatly tend to immortalise British rule in the East. It would be hard to word a claim more modestly than that for this most noble work. Although Thugs trace their origin to the battle of Kali against Raktabija, their foundation myth departs from Brahminical versions of the Puranas. Thugs considered themselves children of Kali (a Hindu goddess), created from her sweat. However, many of the Thugs who were captured and convicted by the British were Muslims, perhaps up to a third. "It is God who kills, but Bhowanee has [a] name for it." "God is all in all, for good and evil." "God has appointed blood for [Bhowanee's] food, saying 'khoon tum khao': feed thou upon blood. In my opinion it is very bad, but what can she do, being ordered to subsist upon blood!" "Bhowanee is happy and more so in proportion to the blood that is shed." The Muslim thugs while retaining their monotheistic faith, had functionalised Bhavani for Thuggee and she was syncretised as a spirit subordinate to Allah. A Muslim thug caught by Sleeman stated "In my heart, I take the name of God, when I strangle a man – saying "thou God and ruler!" "Alla, toomee Malik!" I do not pray to Bhowanee, but I worship her." Other Muslim thugs who had agreed to testify for Sleeman, stated they had assimilated Bhavani with Islamic prophet Muhammad's daughter Fatimah who killed Raktabija and started the practice of Thuggee. According to historian Mike Dash, the Thugs had no religious motive to kill. When religious elements were present among Thugs their beliefs, in principle, were little different from many others on the Indian subcontinent who attributed their success or failure to supernatural powers: "Indeed all of the Thugs's legends concerning the goddess [Kali] featured exactly the cautionary notes typical of folklore." Donald Friell McLeod who led the campaign against them in Rajputana Agency, recorded traditions of their origins. According to them, they were originally Muslims and were taught Thugee by the deity Devi or Bhavani. They then joined the Lodha people and migrated to Delhi where 84 tribes who were a part of all the criminal clans of India also became a part of the Thugs. A physician belonging to these 84 tribes gained prominence after curing a royal elephant and was murdered by other Thugs. A schism developed and they left Delhi, which in turn led to the origin of seven Muslim tribes. These tribes according to McLeod were named Bhyns, Bursot, Kachinee, Hutar, Kathur Gugra, Behleem and Ganoo. The thugs from Delhi according to him were separated into more than 12 "classes". The earliest recorded traditions about origins of Thugs dates to 1760. Based on genealogies recounted by some Thugs, historian Mike Dash stated that the start of Thuggee can be dated to the second half of 17th century. A general consensus among them was that they originated from Delhi. The thug Gholam Hossyn caught in early 1800s stated that his accomplices believed that Thugs had existed since the time of Alexander the Great. Another tradition from Thugs who lived in the early 1800s stated that they had lived in Delhi till the time of Akbar and consisted of seven great Muslim clans, though they had Hindu names, during the period. After one of them killed a favoured slave of Akbar, they left Delhi for other regions to avoid being targeted by the emperor. A Brahmin thug interrogated by Sleeman referred to the Muslim thugs as "Kunjurs" or Kanjars though another Thug denied this. Kim Wagner asserts that we can analyse their traditions about events after their flight from Delhi "to a much greater advantage". A tradition recounted by a captive Thug stated that the Thugs had originally tried to settle in Agra and later in Akoopore in the Doab region. However, they had to flee to Himmutpur and later to Parihara after their kings started demanding more share of the loot. The original Muslim Thugs in turn helped spread Thuggee amongst other groups like the Brahmins, Rajputs, Hindus, the Lodhi people and the Ahir people. One thug stated that some of the ancestors of the Thugs were forced to disguise themselves as Khunjurs while fleeing Delhi but were high-caste Muslims. He, however, stated that their claimed descent may be wrong and that some of them may have in part originated from poor people who worked in Mughal army's camps. However unlike their claims of the Thug clans' being closed to outsiders, people of all backgrounds were allowed to join by the early 19th century according to available evidence. They considered it sinful to kill women, fakirs, bards, musicians and dancers. Like the ancient Hindu texts which distinguished robbery from murder of Brahmans, women or children as violent crimes, many Thugs considered it taboo to kill people of such categories. Those who worked in lowly professions, the diseased and disabled were also forbidden as victims based on their folk belief. The thugs who broke these rules of the fraternity were often believed to have been targeted by divine punishment and their manner of death was thought to depend upon the rules they broke. The East India Company officers since the time of Thomas Perry, who was appointed to Etawah in 1811, came to understand that there were many Thug groups and they all viewed themselves to be different than the other group. The Thug sects were mostly identified based on their habitat, but also based on their professions. The sect called Jamuldahee was named so because its members lived along the Yamuna river, they hailed from the Doab and Awadh regions. Another stated origin is that their ancestor was the Thug Jumulud Deen. The Telinganie originated from Telengana, Arcottees from Arcot and Beraries from Berar. The Lodaha sect, mostly concentrated in Bihar, were caravaneers named after the lodha or load they carried and according to a Thug from the Doab, originated from the same ancestors of his clan. The Lodahas were prevalent in the region around Nepal in Bihar and Bengal during the tenure of Perry and originally hailed from Awadh which they left around 1700. A Deccan Thug stated that the "Hindu Thugs of Talghat", located around the Krishna River, didn't marry with the Telinganies whom they considered to be descendants of lower classes as a result of their professions. The Telinganie sect were also disparagingly called Handeewuls (from handi) due to their eating habits. The Pungoo or Bungoo of Bengal derived their name from the region, with the Lodhees or Lodaha also present. The Motheea sect of Rampur-Purnia region was from a caste of weavers and their name derived from the practice of giving "handful" (muhti) of the spoils to the head. In the Uttar Pradesh the sects were: the Korkureeas from Kohrur, Agureeas of Agra, Jumaldahees, Lodhees and Tundals. The Multaneea were from Multan. In Madhya Pradesh the sects were: Bangureeas or Banjaras, Balheems or Bulheems, Khokhureeas and Soopurreeas of Sheopur. In modern Rajasthan, the sects were Guguras whose name derives from river Ghaggar and Sooseeas who were part of the Dhanuk clan. The Dhoulanee sect existed in modern-day Maharashtra. The Duckunies of Deccan were from Munirabad and Kurnaketies from Carnatic region. Another sect was Kathurs whose name derives from a bowl called kathota, based on a tradition of a man who held it during celebrations by Thugs. The Qulundera sect's name was derived from the Muslim saints called qalandar. There were also Jogee thugs who were divided into twelve sub-groups. According to Feringheea, the Brahmins of Tehngoor village of Parihar were taught the Thuggee after they accompanied the kings of Meos to Delhi and later helped in spreading it in the region around Murnae. He also states that two of his ancestors who had settled and intermarried with Brahmins of Murnae about seven generations ago, which led to the introduction of Thuggee in the area. A Thug hailing from Shikohabad whilst talking of his clan's origin recounted to Perry a tradition that the Munhars were influenced to take up Thuggee after witnessing the immense plunder acquired by Afghans, Mewatties and the Sheikhs. Sleeman in 1839 identified a band called "Meypunnaists" who he stated abducted children to sell them further. Another band called "Tashmabazes" who utilised methods introduced by a British soldier deployed at Kanpur in 1802 were also identified by him. The group called "River Thugs" were based deep in the South Bengal region. The British view of the Thuggee was merely as a form of ritual murder by Kali-worshippers. Sleeman's view of it as an aberrant faith was based on the contemporary British view of Hinduism as a despicable and immoral faith of idol worship. R. C. Sherwood in Asiatick Resarches published in 1820 traces this phenomenon back to the Muslim conquests of India and suggested links to Hindu mythology. Charles Trevelyan however instead of seeing them as a deviant sect, considered them to be representatives of the "essence" of Hinduism which he considered as "evil" and "false". Sleeman considered some Brahmins acted as intelligence providers to Thugs, claiming that they profited from Thuggee and directed it. 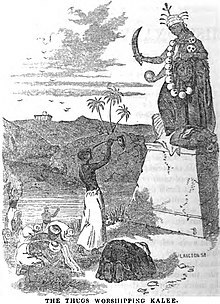 Kali's worship by thugs, both Muslims and Hindus, was emphasised by the British. McLeod commented, "It is a notable fact that not only amongst the Thugs, but in an especial manner among all lawless fraternities, and to a certain extent throughout the uneducated population of Central India, the Mussulmans vie with the Hindus in a devotion of this sanguinary deity (Devi or Bhavani) far exceeding that they pay to any other." David Ochterlony blamed the Pindaris for the rise of Thuggee while Sleeman blamed it on Indian rulers dismissing their armies which took away the jobs of many soldiers. Based on Sleeman's writings about the Thugs, Robert Vane Russell claimed that most of them were Kanjars. He viewed the Muslim Kanjars as having recently converted to Islam. Alexander Cunningham in 1882 had commented on Hiouen-Thsang's remarks about "people who visited Kahalgaon forgot to leave it", stating that the actual reason might have been different than what the monk meant and made an analogy of it with Kahalgaon's later reputation as a place frequented by the "River Thugs". Contemporary scholarship is increasingly skeptical of the "thuggee" concept, and has questioned the existence of such a phenomenon. The colonial representation of thuggee is said to be full of inconsistencies and exaggerations in modern times. Numerous historians have described "thuggee" as basically the invention of the British colonial regime. Martine van Woerkens of École Pratique des Hautes Études writes that evidence for a Thug cult in the 19th century was the product of "colonial imaginings", arising from British fear of the little-known interior of India, as well as limited understanding of the religious and social practices of its inhabitants. Cynthia Ann Humes states that the testimony of most of the thugs captured by Sleeman doesn't support his view of priests profiting from and directing the Thugs. She adds that the Islamic idea of fate or Iqbal was more commonly invoked while invoking Bhavani was rare. Historian Kim Wagner views the policies of East India Company in relation to dismissal of armies of the conquered Indian kingdoms as being responsible for Thuggee. Roaming bands of freelance soldiers had often joined one kingdom or another during the pre-British era, with the main income of many armies coming from plunder. After being dismissed from military service, they turned to robbing as a means of subsistence. He also contested whether the thugs mentioned by Firuz Shah Tughlaq's biography were actually the same Thugs the British authorities fought against. The Thugs were popularised by books such as Philip Meadows Taylor's 1839 novel, Confessions of a Thug, which introduced the word "thug" to the English language. Ameer Ali, the protagonist of Confessions of a Thug, was said to be based on Syeed Amir Ali. The 1839 novel Confessions of a Thug by Philip Meadows Taylor is based on the Thuggee cult, revolving around a fictional Thug called Ameer Ali. The novel popularized the word "thug" in the English language. The 1931 crime novel The Case of the Frightened Lady by Edgar Wallace makes an indirect reference to the Thuggee murders by featuring "Indian scarves" used as murder weapons, as do its 1940 and 1963 West German film adaptations. The 1939 film Gunga Din features British soldiers' conflict with a resurgent sect of Thuggee cultists. Sympathy For The Devil (1968), a song by The Rolling Stones, features the lyrics: "And I laid traps for the troubadors / Who get killed before they reach Bombay" possibly referencing the murder of Tibetan musicians by Thuggee cultists. The Stranglers of Bombay (1959), a film centering about a lone British officer investigating and uncovering the doings of the Thuggee cult. Help! (1965), a film revolving around The Beatles' encounters with an Eastern Cult, is thought to parody the Thuggee. The Deceivers (1988) is an adventure film based on the 1952 John Masters novel of the same name regarding the murderous Thugs of India. Pierce Brosnan plays William Savage, a tax-collector of a British-Indian company in 1825 who goes under cover to investigate a Thuggee sect. Indiana Jones and the Temple of Doom (1984) showcases the Thuggee cult with fictionalized religious ritual and the primary antagonist, Mola Ram, being a Thuggee High Priest of Kali. The fictional DC Comics villain Ravan (starting 1987), a member of the Suicide Squad, is a modern-day member of the Thuggee cult. The Black Company, a dark fantasy series by Glen Cook, features a cult called the Deceivers, largely based on the Thuggee, who play a major role in the later novels. Ameer Ali thug na peela rumal ni gaanth, a novel in 3 parts by the famous Gujarati thriller writer Harkisan Mehta, is a fictionalized account of the thug Amir Ali, with references to the infamous Pindari chief Chitu Pindari. Theeran Adhigaaram Ondru (2017; Tamil) an honest police officer finds himself transferred again and again due to his sincerity. After his latest transfer, he comes across a file that involves a gang of ruthless thieves who loot and kill along the highway. A Tamil movie Theeran Adhigaaram Ondru (2017), was also made in reference to this group. A group of 13 people whose roots go back to these Thuggee tribes camouflaged themselves as a logistics and goods delivery vendors and plundered random cities and brutally murdered families, women and children included. Tamil Nadu police took this matter seriously when a member of legislative assembly was victimized. It took a country-wide operation with limited resources spread over 18 months to pin down this cult group. Thugs of Hindostan (2018) is a Bollywood epic action-adventure film based on a band of Thugs resisting the British East India Company's rule in India. The film stars Amitabh Bachchan, Aamir Khan, Katrina Kaif, Fatima Sana Shaikh and Lloyd Owen. ^ K. Wagner (2007). Thuggee: Banditry and the British in Early Nineteenth-Century India. Springer. p. 26. ISBN 978-0-230-59020-5. ^ "Thuggees – the Cult Assassins of India". ancient-origins.net. 2 October 2014. ^ "Thugs". 1902encyclopedia.com. Retrieved 1 October 2017. ^ Cristina M. Gámez-Fernández; Om P. Dwivedi (2014). Tabish Khair: Critical Perspectives. Cambridge Scholars Publishing. ISBN 9781443857888. ^ a b MacFie, Alexander Lyon (2008). "Thuggee: An orientalist construction?". Rethinking History. 12 (3): 383–397. doi:10.1080/13642520802193262. ^ a b S. Shankar (2001). Textual Traffic: Colonialism, Modernity, and the Economy of the Text. SUNY Press. ISBN 978-0791449929. ^ "Tracing India's cult of Thugs". 3 August 2003. Los Angeles Times. ^ a b Mike Dash (3 February 2011). Thuggee: Banditry and the British in Early Nineteenth-Century India. Granta. pp. 28, 36 & 37. ISBN 978-1-84708-473-6. ^ K. Wagner (2007). Thuggee: Banditry and the British in Early Nineteenth-Century India. Springer. p. 154; 155. ISBN 978-0-230-59020-5. ^ a b c Martine van Woerkens (3 February 2011). 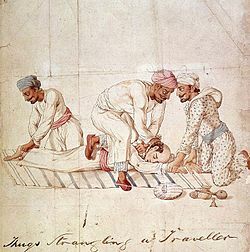 The Strangled Traveler: Colonial Imaginings and the Thugs of India. University of Chicago Press. p. 136. ISBN 978-0-226-85086-3. ^ a b Mike Dash (3 February 2011). Thuggee: Banditry and the British in Early Nineteenth-Century India. Granta. p. 37. ISBN 9781847084736. ^ a b c K. Wagner (2007). Thuggee: Banditry and the British in Early Nineteenth-Century India. Springer. p. 92. ISBN 9780230590205. ^ a b c David Scott Katsan (2006). The Oxford Encyclopedia of British Literature, Volume 1. Oxford University Press. p. 141. ISBN 9780195169218. ^ R.V. Russell; R.B.H. Lai (1995). The tribes and castes of the central provinces of India. Asian Educational Services. p. 559. ISBN 978-81-206-0833-7. Retrieved 19 April 2011. ^ Mike Dash (3 February 2011). Thug: The True Story Of India's Murderous Cult. p. 33. ISBN 9781847084736. ^ a b Mike Dash (3 February 2011). Thuggee: Banditry and the British in Early Nineteenth-Century India. Granta. p. 193. ISBN 9781847084736. ^ Mike Dash (3 February 2011). Thug: The True Story Of India's Murderous Cult. p. 77. ISBN 9781847084736. ^ a b Mike Dash (3 February 2011). Thug: The True Story Of India's Murderous Cult. p. 73. ISBN 9781847084736. ^ Mike Dash (3 February 2011). Thug: The True Story Of India's Murderous Cult. p. 79. ISBN 9781847084736. ^ Mike Dash (3 February 2011). Thug: The True Story Of India's Murderous Cult. p. 67. ISBN 9781847084736. ^ Kim Wagner (12 July 2007). Thuggee: Banditry and the British in Early Nineteenth-Century India. p. 110. ISBN 9780230590205. ^ Kim Wagner (12 July 2007). Thuggee: Banditry and the British in Early Nineteenth-Century India. p. 116. ISBN 9780230590205. ^ Kim Wagner (12 July 2007). Thuggee: Banditry and the British in Early Nineteenth-Century India. p. 135. ISBN 9780230590205. ^ Mike Dash (3 February 2011). Thug: The True Story Of India's Murderous Cult. p. 87. ISBN 9781847084736. ^ Mike Dash (3 February 2011). Thug: The True Story Of India's Murderous Cult. p. 84. ISBN 9781847084736. ^ Martine van Woerkens (November 2002). The Strangled Traveler: Colonial Imaginings and the Thugs of India. p. 146. ISBN 9780226850856. ^ Kim Wagner. Thuggee: Banditry and the British in Early Nineteenth-Century India. p. 107. ^ Martine van Woerkens. The Strangled Traveler: Colonial Imaginings and the Thugs of India. p. 147. ^ Mike Dash. Thug: The True Story Of India's Murderous Cult. p. 92. ^ "Thug – Indian bandit". Britannica.com. Retrieved 1 October 2017. ^ a b Martine van Woerkens (2002). The Strangled Traveler: Colonial Imaginings and the Thugs of India. University of Chicago Press. p. 110. ISBN 9780226850856. ^ K. Wagner (2007). Thuggee: Banditry and the British in Early Nineteenth-Century India. Springer. p. 26; 27; 28. ISBN 9780230590205. ^ Richard James Popplewell (1995). Intelligence and imperial defence: British intelligence and the defence of the Indian Empire, 1904–1924. Frank Cass. p. 11. ISBN 978-0-7146-4580-3. Retrieved 16 April 2011. ^ Lois H. Gresh; Robert Weinberg (4 April 2008). Why Did It Have To Be Snakes: From Science to the Supernatural, The Many Mysteries of Indiana Jones. John Wiley and Sons. pp. 104–107. ISBN 978-0-470-22556-1. Retrieved 16 April 2011. ^ Mike Dash (3 February 2011). Thuggee: Banditry and the British in Early Nineteenth-Century India. Granta. p. 247; 248; 249. ISBN 9781847084736. ^ K. Wagner (2007). Thuggee: Banditry and the British in Early Nineteenth-Century India. Springer. pp. 7, 8. ISBN 9780230590205. ^ K. Wagner (2007). Thuggee: Banditry and the British in Early Nineteenth-Century India. Springer. p. 167. ISBN 9780230590205. ^ Mike Dash (3 February 2011). Thuggee: Banditry and the British in Early Nineteenth-Century India. Granta. p. 193. ISBN 9781847084736. ^ Mike Dash (3 February 2011). Thuggee: Banditry and the British in Early Nineteenth-Century India. Granta. p. 48. ISBN 9781847084736. ^ Mike Dash (3 February 2011). Thuggee: Banditry and the British in Early Nineteenth-Century India. Granta. p. 49. ISBN 9781847084736. ^ K. Wagner (2007). Thuggee: Banditry and the British in Early Nineteenth-Century India. Springer. p. 168. ISBN 9780230590205. ^ a b Twain, Mark (18 August 2006). Following the Equator (ASCII). EBook. Project Gutenberg. Retrieved 27 February 2011. ^ a b Mike Dash (3 February 2011). Thuggee: Banditry and the British in Early Nineteenth-Century India. Granta. p. 249. ISBN 9781847084736. ^ "Thugs Traditional View". BBC. Archived from the original (shtml) on 17 October 2007. Retrieved 17 September 2007. ^ Sinister sects: Thug, Mike Dash's investigation into the gangs who preyed on travellers in 19th-century India by Kevin Rushby, The Guardian, Saturday, 11 June 2005. ^ "The Thugs Worshipping Kalee". The Missionary Repository for Youth, and Sunday School Missionary Magazine. XII: 98. 1848. Retrieved 6 November 2015. ^ Brigitte Luchesi; Kocku von Stuckrad (2004). Religion im kulturellen Diskurs. Walter de Gruyter. pp. 623–624. ISBN 978-3-11-017790-9. Retrieved 20 April 2011. ^ Douglas M. Peers (2013). India Under Colonial Rule: 1700-1885. Routledge. p. 57. ISBN 978-1-31-788286-2. ^ Martine van Wœrkens; Catherine Tihanyi (2002). The Strangled Traveler: Colonial Imaginings and the Thugs of India. University of Chicago Press. p. 170. ISBN 978-0-226-85086-3. Retrieved 19 April 2011. ^ K. Wagner (2007). Thuggee: Banditry and the British in Early Nineteenth-Century India. Springer. p. 141. ISBN 9780230590205. ^ K. Wagner (2007). Thuggee: Banditry and the British in Early Nineteenth-Century India. Springer. p. 122. ISBN 9780230590205. ^ K. Wagner (2007). Thuggee: Banditry and the British in Early Nineteenth-Century India. Springer. p. 154; 155. ISBN 9780230590205. ^ Mike Dash (3 February 2011). Thug: The True Story Of India's Murderous Cult. p. 92. ISBN 9781847084736. ^ Martine van Woerkens. The Strangled Traveler: Colonial Imaginings and the Thugs of India. p. 111. ^ Mike Dash. Thug: The True Story Of India's Murderous Cult. p. 93. ^ Martine van Woerkens. The Strangled Traveler: Colonial Imaginings and the Thugs of India. p. 165. ^ Mike Dash (3 February 2011). Thuggee: Banditry and the British in Early Nineteenth-Century India. Granta. p. 16; 39. ISBN 9781847084736. ^ Mike Dash (3 February 2011). Thuggee: Banditry and the British in Early Nineteenth-Century India. Granta. p. 38; 39. ISBN 9781847084736. ^ Martine van Woerkens (November 2002). The Strangled Traveler: Colonial Imaginings and the Thugs of India. p. 134. ISBN 9780226850863. ^ Martine van Woerkens (November 2002). The Strangled Traveler: Colonial Imaginings and the Thugs of India. p. 133. ISBN 9780226850863. ^ Martine van Woerkens (November 2002). The Strangled Traveler: Colonial Imaginings and the Thugs of India. p. 133;134. ISBN 9780226850863. ^ Martine van Woerkens (November 2002). The Strangled Traveler: Colonial Imaginings and the Thugs of India. p. 103. ISBN 9780226850856. ^ Will Sweetman, Aditya Malik (23 May 2016). Hinduism in India: Modern and Contemporary Movements. SAGE Publications India. ISBN 9789351502319. ^ Bart Moore-Gilbert (1996). Writing India, 1757-1990: The Literature of British India. Manchester University Press. p. 86. ISBN 9780719042669. ^ P.D. Reeves (10 June 2010). Sleeman in Oudh: An Abridgement of W. H. Sleeman's A Journey Through the Kingdom of Oude in 1849–50. Cambridge University Press. ISBN 9780521153096. ^ a b Encountering Kālī: In the Margins, at the Center, in the West. University of California Press. 2003. ISBN 9780520232396. ^ K. Wagner (2007). Thuggee: Banditry and the British in Early Nineteenth-Century India. Springer. p. 140; 141. ISBN 9780230590205. ^ K.Wagner (2007). Thuggee: Banditry and the British in Early Nineteenth-Century India. Springer. ISBN 9780230590205. ^ R. Roque; K. Wagner (2011). Engaging Colonial Knowledge: Reading European Archives in World History. Springer. ISBN 978-0230360075. ^ van Woerkens, Martine (2002). The Strangled Traveler: Colonial Imaginings and the Thugs of India. ^ K. Wagner (2007). Thuggee: Banditry and the British in Early Nineteenth-Century India. Springer. p. 156. ISBN 9780230590205. ^ "Sheikh Sajjan". Sikhiwiki.org. Retrieved 8 July 2017. This article incorporates text from a publication now in the public domain: Chisholm, Hugh, ed. (1911). "Thuggee" . Encyclopædia Britannica (11th ed.). Cambridge University Press. Guidolin, Monica "Gli strangolatori di Kali. Il culto thag tra immaginario e realtà storica", Aurelia Edizioni, 2012, ISBN 978-88-89763-50-6. Look up Thuggee in Wiktionary, the free dictionary.